Anyone who knows me well knows I am almost always up for a trip and an adventure! Just name the place and I will be there. So what do I do when my good friend, Amy, invites me to join her and a couple of her friends on a trip to Greece? Request the vacation time and book pronto, of course! I went to Greece in July 2014. The girls were going to spend the entire week they were in Greece on the island of Skiathos. Since it is such a long trip to get there, I decided to split my time between Skiathos and other parts of Greece. 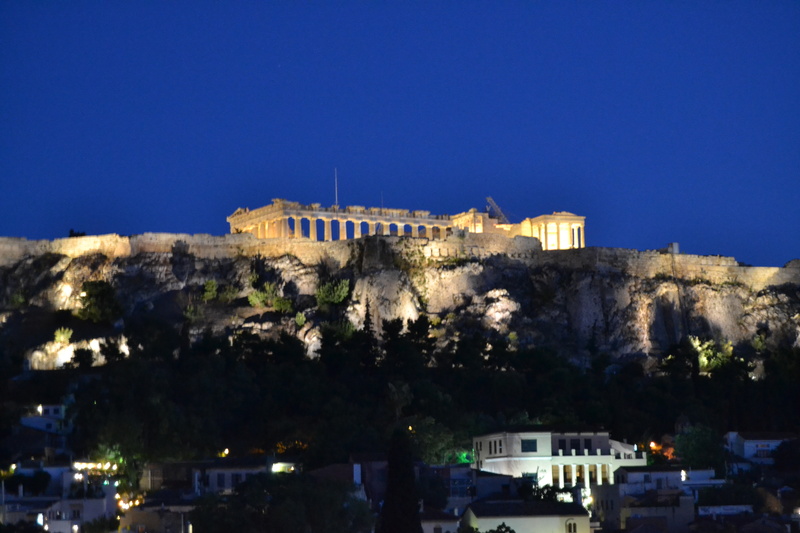 I spent two days in Athens, met them in Skiathos, then finished the trip with visits to Mykonos and Santorini. Greece is an amazingly beautiful country. The Greeks I encountered were very friendly and the food is delicious. I ate a lot of seafood and Greek salads, which were perfect for me because I don’t like lettuce and Greek salads have no lettuce, just veggies, feta cheese and seasonings. It was the perfect light meal! 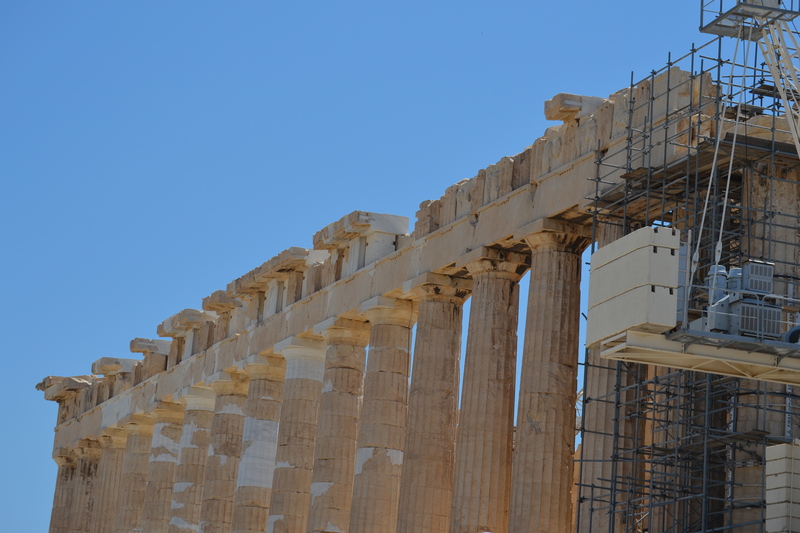 Athens: I figured since I was flying all the way over to Greece, I should spend a couple of days in Athens to explore the city and visit the Parthenon. I toured the city using Rick Steves’ Walking Tour. If you do not know who Rick Steves is, he is the author of European travel guides and also has a TV show on PBS. His books are my go-to when I am booking trips to Europe. I downloaded his app and then the audio walking tour (both for free!) onto my phone. When I set out on the tour, I used one of my ear buds to listen to him so I could also be aware of my surroundings at all time. It worked out perfectly! The best part of his tour is that I was able to listen and then stop the tour and take photos before continuing on. The first six photos below were taken outside of the Parliament House. This building was once the palace for the first King of Greece after the Ottoman occupation and now seats the members of Parliament.The gentlemen in red caps are the guards. They have a Changing of the Guards ceremony similar to the one in front of Buckingham Palace in London (just on a much smaller scale). I love the uniforms these guards wore, especially their shoes! The pom on the end is awesome! According to Rick Steves, it is a huge honor for Greek men to be guards and they take their positions very seriously. The statue of the religious figure above saved my sanity one night after dinner. I found a neat restaurant to eat at and somehow took a wrong turn on the way back to my hotel and ended up completely disoriented. I could not figure out which way my hotel was or where the wrong turn occurred. I had a moment or two of panic – “I am lost. I am going to wander around this city forever, never to be found again.” – totally irrational but this is what happens when I cannot depend on my phone (sad, I know). So I kept walking and came to a courtyard area…and saw this statue, which I had seen earlier in the day on the walking tour. Once I saw him, I was able to orient myself and realized I was just a couple of blocks from my hotel. Whew! And let’s face it, I could have stopped at one of the many restaurants around and someone would have helped me find my hotel…so I really didn’t need to worry. On my second day in Athens, I went to the Parthenon. 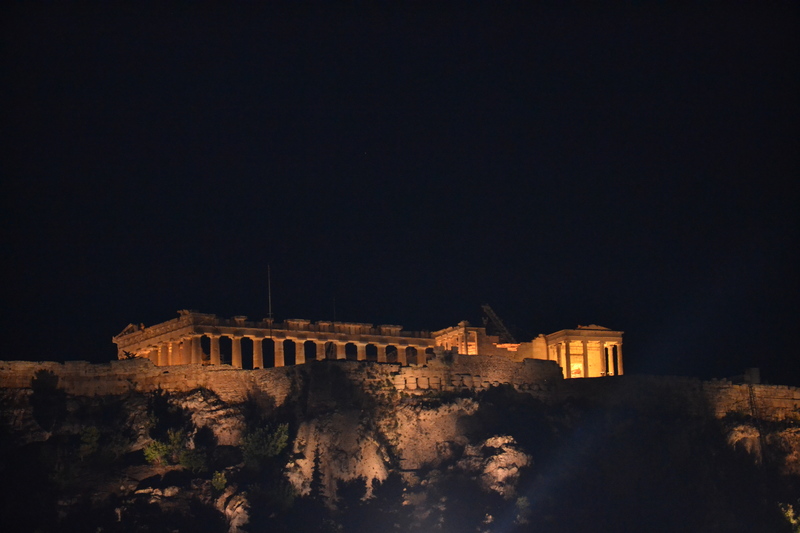 The Parthenon is on top of a hill overlooking Athens. It was a site to behold from the rooftop deck of my hotel and is quite a climb to the top but worth the effort. There was a lot of construction going on while I was there because they are working to restore and preserve the site.